The 2018 Major League Baseball postseason will officially get underway tonight with the National League Wild Card game. 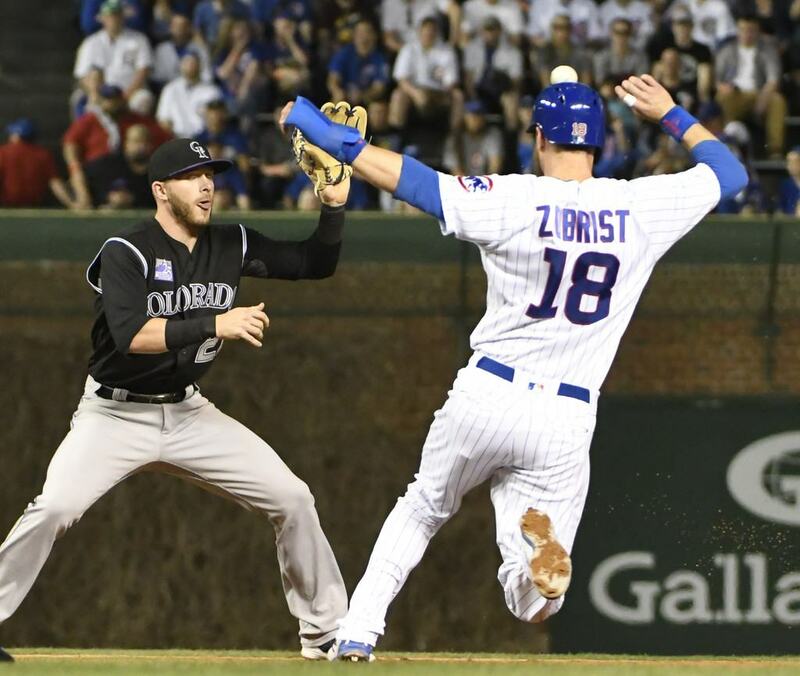 While the majority of the bracket will have at least a few days of rest, there is no rest for the NL Wild Card representatives, the Colorado Rockies and Chicago Cubs. Both teams are coming off losses in the NL Central and NL West tiebreaker games yesterday, and will now have to play in the winner-take-all game at Wrigley Field tonight. The Cubs will make their fourth straight appearance in the postseason and will play in the Wild Card game for the second time in this four-year span. Tonight will also be the first time the Cubs will be the host team. Meanwhile, the Rockies will make their second straight road appearance in the game and will look to erase the memories of their one-and-done loss to the Arizona Diamondbacks last year. Despite the losses yesterday, both the Rockies and Cubs are coming off great seasons. Both of these teams had ups and downs of course, but both teams feature star-studded lineups, they have played some of the best baseball in the league and fans of both teams will be on the edge of their seats from start-to-finish tonight. Before I get to my prediction for this game, let’s look at some of the keys to tonight’s 2018 playoff opener. We will have a lefty VS lefty battle on the mound tonight. Rockies Manager Bud Black announced he will send Kyle Freeland to the mound as his starting pitcher, and Cubs Manager Joe Maddon will give the ball to his ace, Jon Lester. Let me begin with Lester, who just finished another solid season. He posted similar numbers to those from 2016 when he finished second in the NL Cy Young award voting behind Max Scherzer. Lester is no stranger to the postseason, and quite frankly, he’s no stranger to the Wild Card. Lester started the 2014 American League Wild Card game for the Oakland Athletics, where he kept the Kansas City Royals in check for the first seven innings. Lester is a three-time world champion; he won the NLCS MVP in 2016, he just finished his 11th straight season with 30 starts or more, and he has delivered in the postseason many times before for many different teams. If you’re Joe Maddon, Lester is THE GUY you want on the mound in your house tonight. Kyle Freeland is coming off one of the best seasons of his young career for the Rockies. Freeland won 17 games in 2018 (4th most in the NL), posted a 2.85 ERA (5th lowest in the NL), and did a great job keeping runs off the board. On April 29, Freeland faced the Cubs for the only time in 2018, losing 3-2 in Chicago. The Cubs will be facing a different Freeland then they saw on that night. That loss was the turning point of his season as he would only lose three more games after that night, winning 16 of his last 20 starts. While Freeland has been much better at home and he is on short rest, he is needed, he is their guy, and he will be counted on for the Rockies. Both starters are very similar in many ways, but they are different in one very big way, and that is experience. This is Lester’s 9th postseason and he will start in a postseason game for the 22nd time, but this will be the very first postseason start for Freeland, so the advantage in that regard easily goes to Lester. You can boil it down to the best of the best for both starting pitching staffs. Either way, we are in for a duel tonight between a future star and an accomplished veteran. As mentioned earlier, neither team will have the opportunity to have time off, as they both lost in their tie-breakers yesterday. In fact, both the Cubs and Rockies have not had an off day since September 20, 12 days ago. While those may seem like haunting numbers, they can also be considered comforting numbers at the same time for both Cubs and Rockies fans. This means that both teams are at a level playing field when it comes to time off. However, the Cubs have the rest advantage in this scenario despite both teams being on equal rest. The Cubs haven’t left Chicago since their last off day on September 20 when they came back from Arizona, and their only road games since then were on the South side of the city against the White Sox. The Cubs also don’t have to travel for this game like the Rockies do. The Rockies finished their season at home in Denver, traveled to Los Angeles for the tie-breaker, and are now in Chicago for the Wild Card game. At some point, all that traveling is bound to catch up. While the Rockies have played better than the Cubs in their recent stretch of 12 days, it’s the Cubs that have statistically played better in long stretches without off days, especially in the second half of the season. Tonight, we’ll find out which team has enough left to get the job done and earn a well deserved two days off. I’m not talking about the dance battles between the two bullpens, which by now, the Cubs should realize that winning those dance battles doesn’t get you very far – go ask the Milwaukee Brewers how that worked out. Anyway, this game will come down to which bullpen holds up the best, and if the most recent actions come into play, it will not fair well for Chicago. Their bullpen is not healthy, it’s been lackluster, and it seems there aren’t many options for Joe Maddon to feel confident about. The Cubs come in with no Brandon Morrow, Pedro Strop is very unlikely to pitch with his a hamstring injury and he hasn’t pitched in three weeks, Carl Edwards Jr. has been awful in September posting a 5.14 ERA and walking 12 batters in 11 outings, Brandon Kintzler has been an embarrassment this season, and the list goes on forever. Now, with the negatives come some positives as well, and I use that term lightly. For one, the Cubs could go to Jesse Chavez, but he’ll have to come in on short rest following his two scoreless innings of relief yesterday. Mike Montgomery isn’t a terrible choice, but he is also on short rest as he started a critical game this past Sunday against the St. Louis Cardinals. Either way, it seems that it’s up to Lester to get to an 8th or 9th inning with a lead, or things are going to get interesting in the windy city. Meanwhile for the Rockies, they are in a much better situation. Rockies Closer Wade Davis is well rested and has only allowed one run in his last 18 outings, striking out 25 batters. While their Setup Man Adam Ottavino has struggled this year, he is also on perfect rest and Scott Oberg has been phenomenal for the Rockies this year and will be expected to come and pitch in a big spot, maybe even first out of the bullpen. It is safe to say all four of the Rockies relievers are rested up enough to come in and get the Rockies out of trouble, while three out of the four have had either a great season and/or a great end to their 2018 season. This reminds me a lot of the New York Mets and San Francisco Giants from the 2016 Wild Card game, the only difference is Madison Bumgarner is being played by Jon Lester and Santiago Casilla is being played by Brandon Kintzler. The moral of this story is if the Rockies can find a way to get to the Cubs bullpen with a lead or even a tie (like the Mets needed to do against Bumgarner), the Cubs are in trouble. While the Rockies have had success on the road this year with 44 wins, which is one of the best in the NL, their biggest road flaw has been their offense. The Rockies finished the year as the best offensive team in the NL at home and the worst on the road. The difference between their home numbers and their road numbers are drastic. On the road, the Rockies hit .225/.295/.370 and at Coors Field they hit .287/.350/.503. These are HUGE differences, statistically speaking. Put the blame on the air climate in Denver all you want, they are horrendous outside of Denver. As if that wasn’t bad enough, the Rockies lost six of their last 12 road games in September, which included four straight road losses against the Los Angeles Dodgers. The Cubs have the best home record in the National League posting 51 wins this season at Wrigley Field. With players like NL MVP candidate, Javier Báez, Anthony Rizzo, Kris Bryant, Daniel Murphy, and many more, they were able to finish in the top three in the NL for offense at home. While the Cubs lineup can be hit-or-miss at times (like it was yesterday as well as all season), it will be more of a postseason atmosphere tonight, where I expect the Cubs will thrive. This is going to be a close game as both teams are very similar, evenly matched, and they make this one of the toughest games to pick. While the Cubs ended their season 15-13 and let the Brewers crawl back in to win the division, they are in their house tonight with their most trustworthy starter on the mound. Bud Black has once again done a fabulous job with this Rockies team. He took a team with no shot of winning the NL West in the beginning of the season to a tie-breaker game against the team that was supposed to win the division by eight games. The Rockies are a young team with a ton of talent with players like Nolan Arenado and Trevor Story, as well as German Márquez, who is improving every year, and Kyle Freeland who has a big future in that rotation. The future is bright in Colorado. However, the future is not here just yet. If this were a best of five or seven, I would give the edge to the Rockies as they have a better bullpen and would have the offensive advantage at Coors Field later on, but it’s only one game on the road in Chicago. Anything can happen in one game and in this one game, the Cubs have the home field and one of the most experienced postseason pitchers on the mound. I expect Wrigley Field to be loud and ready for this one. I think the Cubs will feed off the crowd and will grab a lead early. Freeland and Lester will go seven strong innings which will take some pressure off the bullpen. The Rockies (as they have on the road all year) will struggle to produce on offense and the Cubs will move on to the National League Division Series for the fourth straight year and set up a highly anticipated matchup with the newly crowned NL Central Champions, Milwaukee Brewers. DO YOU AGREE WITH MY NATIONAL LEAGUE WILD-CARD PICK?